In 1137, one of the most impressive cathedrals of Paris was completed. The immense architecture of the Notre Dame struck awe into the hearts of the residents it surrounded, but one such feature did this more so than any other, that of the grotesque faces of the many gargoyles found perched on corners and high up ledges of the Cathedral, the telltale guardians of the city and of the building itself. Many mythologies sprang up about these fearsome stone statues, legends of such creatures changing from their typical form into...grotesque guardians, brought to life by divine powers of the universe. Even more curious, in modern times witnesses are reporting massive winged beasts, grotesquely shaped and described only as Gargoyles! Many people believe Gargoyles originated as architectural features designed to flow water away from the sides of a building, to preserve the walls, as we remember the classic medieval monsters on Churches etc. However, some gargoyles are much older., dating back to ancient Greece, Etruscans, Egyptians and Rome. These gargoyles were constructed out of terracotta clay and other stone working as well. There is even evidence of a 13,000-year-old stone crocodile found in what is now Turkey is considered to be the oldest gargoyle in existence! Gargoyles were placed on the roofs of Egyptian temples where their mouths served as a spout for water. Similar pieces were also seen on the sides of Greek temples, these figures were often carved into the shape of lions, eagles and other ferocious animals of the Aegean sea and regions explored by their empires adventurers. We can still see these ancient Gargoyles today! In all, there are still 39 of these waterspouts from the original 102 used on the Temple of Zeus in Greece still remaining. All were crafted from marble and carved in the shape of lion’s heads - a majestic animal much regaled by the ancient Greeks. Lions were most popular because of its associations with the sun, an ancient symbol of great importance, giving life to all the world. The rise of gargoyle lore in Medieval Europe began with St. Romanus of Rouen, a saint and bishop who lived in France during the early middle ages, though his date of birth remains a mystery. Romanus was known for performing Miracles. In one epic tale, the saint was responsible for the destruction of a pagan temple. In the most famous, Romanus is responsible for slaying a beast known as Gargouille, though some versions say the name of the beast was ‘Goji’. St Romanus was summoned by terrified townspeople to attempt to slay the beast. As he had performed miracles in the past, the people thought he might be able to rid them of this terrible monster. The account describes how in the wild swamps and bogs of the left bank of Seine, a massive serpent lived and would constantly devour and destroy those who came across it. Romanus could only find one man to help him seek the beast, as all the other townspeople were far to afraid. This man had been condemned to death and so had nothing to lose. St. Romanus used the power of god to subdue the monster and take back to town to be killed in front of the townsfolk in order so they could be assured that they were safe. The monster was to be burned in the town square before everyone, so that all would be witness to its destruction. As they watched the monstrous body sizzle, its flesh crackling insides oozing a dark, putrid substance, the head of the monster was left mysteriously unburned. It was summarily hung outside the cathedral as a warning against evil, and the devil. This story represents one of the earliest recorded mythologies surrounding the gargoyles, but is interesting in tis conflation of a enemy monster and a protector, which gargoyles often figure as (one must assume this is mostly due to their practical function protecting buidings from water damage). Gargoyles became useful in other ways, for religious symbolism and storytelling. Roman Catholic Church was gaining momentum and territory in places where it was difficult to spread the message of god. This meant, of course, the construction of many cathedrals and churches. The people missionaries encountered were, for the most part, illiterate, so the use of images and symbols was essential for conveying ideas and beliefs linked to heaven, hell and tales of the old testament. The church was also preaching in places where the population was mainly Pagan, so to appeal to these practitioners the church used iconography that was relevant to their existing religious beliefs. Steven Halpen, a Catholic University Professor, and Paula Gerson, International Museum of Medieval Art argue that gargoyles were a way of embodying the frightening dimensions of the transcending between worlds. The medieval world believed in demons and demonic powers, and that gargoyles were a way of warding off these demonic entities. Their shapes were a way of embodying symbols relevant to medieval society. These people in this society did not have control, and the gargoyles represented the frightening and alluring transcendent, those from other realm. This was a time when things were much more mystical of course, much more superstitious . To contextualize, in 1394 a pig was tried and hung for sacrilege for eating a communion wafer., while a chicken was tried and killed for blasphemy. For the ancient world, the Gargoyle served an important symbolic and practical function. However, are Gargoyles actually, alive?! The notorious case of the NASA gargoyle was first brought to public attention with the story of Frank Shaw, an archivist working for the Houston Space Center. Shaw was working late one night in 1985, and was just leaving the facility walking towards his vehicle when he sighted a black hulking monstrosity perched high on the edge of one of the buildings. Shaw apparently froze in horror at the sight of the grotesque countenance of the monster’s, who allegedly ‘took pleasure’ in Shaw’s raw fright. The creature was still, the Shaw heard a terrific crackling noise and watched as the beast unfurled great wings and began to fly with great strokes of its big wings - Shaw took off toward his vehicle, starting the car and roaring away, never looking back. Interestingly, Shaw remained silent for a while before finally confiding in his superior. Afraid of ridicule, Shaw was amazed to find that a case file had been open on the creature for months before his own sighting took place. The file had been created in response to the brutal slayings and exsanguination of two German Shepherd patrol dogs working for the Space Centre. According to Shaw, he was subjected to intense interrogation, “MIB style,” before he was released. Shaw, his wife, and daughter Desiree all kept silent for over 15 years before releasing their experience to the public. 2010 was a big year for gargoyle sightings, the first in Pampa Acha, a port city approximately 20-miles south of Arica, Chile. A young family encountered bizarre flying creatures they could only describe as real life gargoyles. Carlos Torre along with his wife and two young children. Carlos described the evening as very bright with a full moon setting in and the high beams of his truck the road was well illuminated. It was Carlos’ eldest daughter, Carmen, who noticed a pair of extraordinary creatures through the back window of the truck. Later she would state that she first noticed something floating behind the vehicle. This is a quote from Carmen. The two children would later estimate the size of the creatures to be at least 6 feet in length, as they were quite close to the car and able to judge the size relative to the road. Then the parents took notice: Carlos and his wife Teresa, too, saw the entities as they gained speed overtop and to the front view of the car. These entities were keeping pace with them as they sped down the road at around 60 miles an hour! The family travelled like this for a while, catching glances at them as they drove, until two more appeared in front of the car! The entities leapt in front of the truck on what Carlos would described as “strong hind legs” which were shorter than their upper legs. Carlos managed to avoid a collision with these “gargoyles” and sped up the truck, eventually escaping he creatures, although they were never outright attacked. They arrived and told their family but swore them to secrecy, only later coming out with their account, when an officer from a local military base, the same one Carlos worked on came forward with a similar sighting of what he described as a prehistoric bird like entity, his name was Diego Riquelme. Another similar sighting of a smaller strange winged creature occurred that same year in Chlie, in the heart of Santiago near Pargue Santiago Bustamente. The winged monster was spotted soaring from tree to tree overhead, and appeared more like a flying stingray. 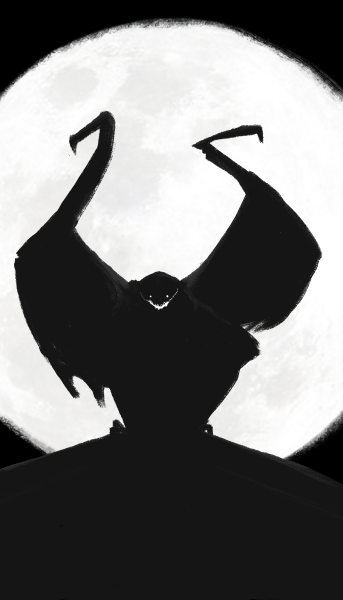 The wings on this horrific flying entity were huge, as described by one young witnessed named in papers as Ignacio. The 2010 gargole spree continued in Puerto Rico, where witness Edgardo Santiago Rodríguez of Barceloneta spotted a horrid creature, something that was to become sensationalized as gárgolas. What’s really creepy about these illicit grotesque creatures is that they are reported to be sucking the blood of animals… Vampirelike, like the Chupacabra. These winged, gargoyle-esque monsters are said to be five feet tall with a muscular build, 4-foot wingspan and terrifying high pitch scream. The witnesses reported to local media that what they saw was not like the Chupacabra of known Puerto Rico legends, but the more human like form and wings, quite unlike the reptilian body known with the Chupacabra. “He was injured in his stomach, his [abdominal] fat could be seen,” noted a witness, describing the injuries suffered by a man on his belly and back, caused as if by “an animal’s claws.” Police officer Miguel Negrón states that he has not seen what is popularly referred to as the gargoyle, but two months ago, while patrolling the area with another officer near the old Guánica Sugar Mill, he heard the beating of powerful wings, as if something was propelling itself off the zinc roof of one of the mill’s cranes. The muscular, humanoid descriptions offered by many witnesses of these winged monsters have also lent comparisons to other known cryptids such as the Jersey Devil and the Mothman of West Virginia, as well as the Owlman of Cornwall. So it seems that whether you believe in the legends of gargoyles or the sightings of modern times, the creatures are seemingly embedded deep within the seeds of the human imagination, as evidenced in the centuries of architecture and most recently in the architecture of media and cryptozoological investigations.